Emtel is keeping up with innovation and has recently launched Airbox, a high-speed best-effort broadband service, or what the company calls “Fiber Through The Air” (FTTA). The service comes at the time when Orange is quickly trying to cover the whole island with fiber and Bharat Telecom is trying to do the same thing to the central regions of Mauritius only. I did say I was going to blog about Orange some time again. There was a news item that told how Orange suggested that prices remain constant and that speed increases, and ICTA wanted that prices fall while speed remains constant, which is plain stupid. However, something nicer appeared on the front of Le Mauricien today (Edit: Today = 26th Feb 2009, I am blogging this article after midnight). If the news is correct and if what it says really happens, we are going to have a 35-45% price fall in ADSL prices. Do you believe that? A friggin 45% decrease in ADSL prices! MyT is going to follow soon according to that same article! New prices applicable as from 1st March 2009! Seriously, this is wicked cool. Is it really? Wait a bit, you will see. There is something I didn’t catch. There is X allowance (X is an integer) and Fair Usage Policy (FUP). I think allowance is a quota where you pay more after exceeding it, while fair usage, you don’t pay but speed falls. That’s me, so don’t consider these words to be a fact. First lemme give you the prices and other stuff. Everything below refers to ASDL, so no MyT’s for now. 128K refers to 128K ADSL. All prices exclude VAT. Got it? 128K home (1 GB allowance) goes to 256K with 3 GB allowance. Price goes to 434 from 650. 33% fall. Nothing yet for 128K home (with FUP). It was not mentioned in the article, saying the info was not obtained from MT. The very best news now: There is a new package! 1 Mbps (with FUP) priced at Rs. 1360! That’s the price of the old 512K connection! Theoretically, you can now get twice the speed for the same price! Then for ASDL Pro, for those who interested. Vat Included I think. 256K goes to Rs. 800 from Rs. 950 (3GB cap). 512K goes to Rs. 1300 from Rs. 1540. For Rodrigues, same thing for ADSL home. For ADSL home 256 goes to Rs. 1600 from Rs. 1860. Personally, I think this is good news. If not for the ridiculously low capping. (3GB on 256? Seriously? That’s less than a Linux distro DVD!) I also appreciate the introduction of the fair-priced 1 Mbps and I might even consider moving to that one when the new price policies start. That’s how 1 Mbps should have been priced from the very start! Now I can call it accessible. And I can finally thank Orange for listening to me: More speed for the same price. They did just that. I don’t know why ICTA was initially rejecting that, but they were not being rational. Also, as you noticed, the FUP does not tell what exactly is the limit. I’d greatly appreciate some more information on that. Not this time I guess. I am done now. Let’s hear your views. Happy? Not happy? What about the capping? Fair? Fair Usage Policy? Love it? Hate it? Suggestions? Today (Today = 27th Feb 2009), news about MyT offers came out, and it’s very good news for them: Their speed doubles for the same price! 256K users will now have 512K. 512K will have 1Mbps and 1 Mbps will have 2 Mbps! Amazing! Some new offers were also added, such as a MyT 512K with added TV channels (15 of them) for Rs. 999 / month. There will also be a 2Mbps offer will be available at Rs. 2999/month! However, as Morinn has pointed out, there must be a catch! I believe personally have two theories. Either Orange had the possibility to offer those speed and prices from the very start, but for some weird reason, they did not. Or the more sombre reason: Capping and FUP will now be strictly enforced. As you probably noticed, for some users, even if they exceeded the unknown FUP limits, their speeds were not affected. I don’t know the limits, but I guess they must be around or less than 10GB. The question is: how can Orange offer twice the speed to all users, without making any upgrades to their networks or buying more bandwidth on the SAFE. Maybe I have missed something that was announced, or that it was done internally, but without upgrades, there is no logical way this can be done! Unless capping is strictly enforced. This will keep heavy downloaders from leeching all the bandwidth, and redistribute the saved bandwidth to other users. This is just a supposition, but a terrifying one none the least. We don’t know the limits, and therefore, don’t know when or how we are going to be capped. Also, a commenter mentioned that 3GB capping. There seems to be a difference between capping, properly said, and Fair Usage Policy. As I said above, the “capping” policy is that if you go over the limits, you pay for additional MB’s downloaded. Whereas for FUP, it’s just that your speed decreases. Probably some kind of limit imposed, or that your connection is given less priority. Another scarier issue: if capping (as in speed reduction) is enforced, it means that connections of users will be monitored to know what they are doing, how much and what they are downloading and from where. All this is just suppositions, but isn’t this called invasion of privacy? Btw, remember how I was ranting about how my speed on Rapidshare was breaking and resuming every 4-5 seconds? It’s back! My download manager reports a download speed, but my router lights don’t flash. Ewww! 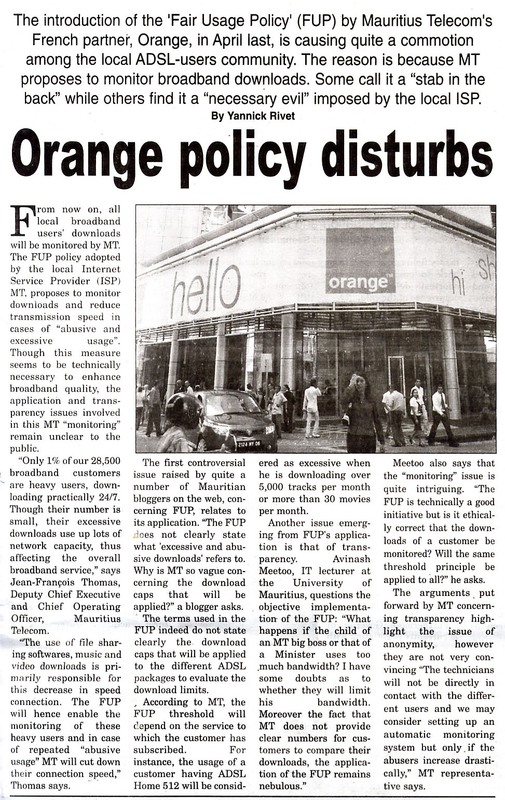 Finally, the issues about FUP have hit the local newspapers! Guru just sent me a scan of the article, and here it is, for you to feast on! This article brought me out of my temporary blogging hibernation (due to exam), but had to blog on it! I couldn’t resist! I must thank News On Sunday for publishing the article and Yannick Rivet for reading Mauritian blogs, and considering our opinions. At least, we now know that Mauritian bloggers are being taken seriously! Here is Mr. Avinash Meetoo’s heavily commented and discussed post about FUP. I’m really sorry since I forgot mentioning this great article.